I don't know about you, but I for one can't stand eating bananas once they have even the slightest of brown speckles. The texture and flavour begin to change and, if I'm honest, they're then usually destined for the bin. 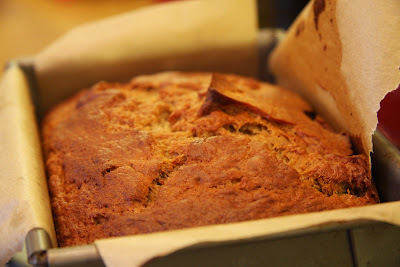 But I hate wasting food, so this recipe comes in handy because the riper the banana the better the flavour of the cake. It's based on a recipe which I hastily scribbled down from a magazine in a waiting room somewhere a few years ago. Well, I scribbled down the main ingredients and then, over time have decided on the quantities which suit me best. 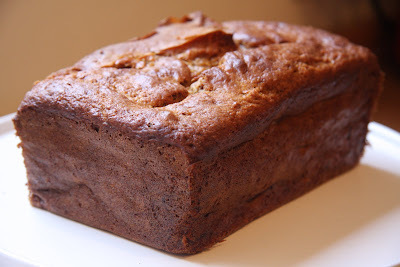 I like adding walnuts for the texture and because they work well with bananas, but you could add any nuts you like, or even sultanas. It's a very moist cake so testing for when it's done can be a tad tricky, but it will continue to set in the tin once you take it out of the oven. Mix the dry ingredients (flour, bicarbonate of soda, spice and sugar) together in a large mixing bowl. In a separate bowl mash the peeled bananas (I find a potato masher makes l ight work of this job) and then stir in the oil, yogurt, eggs and vanilla. 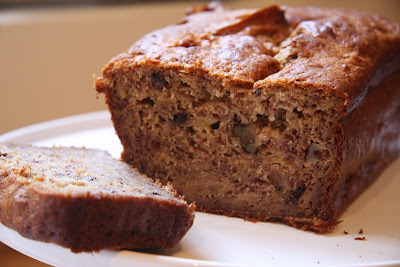 Add the banana mixture to the dry ingredients along with the walnuts and mix well. Pour the mixture into a lined, greased 1 litre loaf tin and bake in the oven at 180 C for 50 minutes to an hour until golden and well risen (I baked mine at 165 C in my fan oven). Depending on your oven, it may take a little longer as it is quite a moist mixture so test with a cake tester or scewer and also press gently in the centre to see whether it feels set. Leave in the tin to cool. You can serve it warm with greek yogurt and honey as a dessert (or even afternoon tea!) or enjoy it just as it is with a cup of tea. Jerusalem artichokes aren't the prettiest looking of vegetables and seem to be much maligned for their (to put it politely) gas inducing properties. 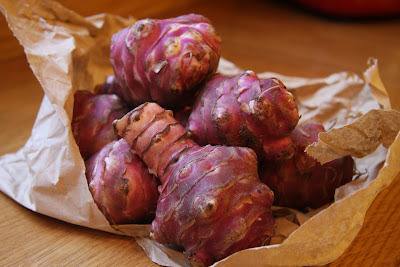 But that's not to say that they can't be transformed from the knobbly roots that they are, into some delicious dishes. I first came across jerusalem artichokes about 12 years ago when I was living in France but didn't get to taste them then as these topinomboux, which grow abundantly even in poor soil, were destined for animal feed. It wasn't until a few years later that I spotted them for sale in the greengrocers back in England that I bought some to make a wild rice, puy lentil and jerusalem artichoke salad. A lovely earthy salad, perfect for the winter months. What I didn't know until recently was that the jerusalem artichoke is from the same family as the sunflower. Looking at the roots (which are cultivated as the vegetable we eat) I could be excused for not guessing, but it's easier to see the family ressemblance when you see the flowers of the plant. 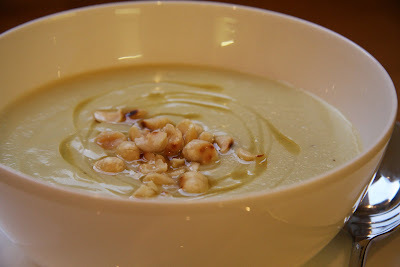 Jerusalem artichokes lend themselves perfectly to a hearty winter soup and the addition of hazelnut oil and toasted hazelnuts raises this soup to something a little special and good enough for a weekend lunch with friends. Finely chop the oinion and slice and wash the leek. Add the butter, dash of olive oil, onion and leek to a large heavy bottomed pan or casserole (which has a lid). Heat gently over a low heat and then place a sheet of baking parchment over the vegetables and tuck it down to seal in the steam. Put the lid on the pan and cook very gently for abuot 10 minutes (checking and stirring regularly to ensure that the vegetables do not turn brown). Discard the baking parchment. Whilst the oinions and leeks are cooking, peel and chop the jerusalem artichokes and then add to the pan along with the stock and bay leaves. Simmer gently until the jerusalem artichokes are cooked though. Remove the bay leaves and then puree the soup until smooth and return to the pan with the lemon juice (add more to taste if you like) and season generously with freshly ground black pepper and salt if needed. 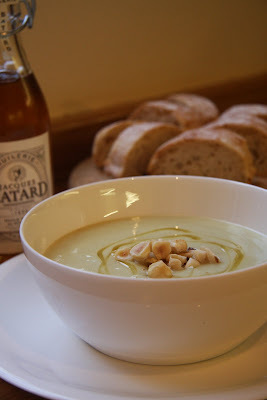 As the soup is warming through slowly, gently toast the hazelnuts in a dry frying pan and then crush slighty (I did this by putting them in a sandwich bag and bashing them with a rolling pin). 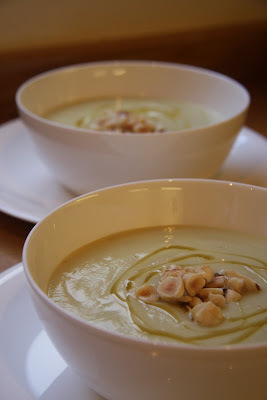 Dish up the soup, drizzle with the hazelnut oil and scatter some toasted nuts in the centre of each bowl. Serves 4 for lunch or 6 as a starter.